The Board of Directors are delighted to announce the appointment of Ian Chandler as team manager. After winning County and England Schoolboy honours Ian began his adult playing career as a professional with Barnsley and Aldershot. During his non-league playing career, he scored 156 goals for Whitley Bay including the winning goal in the 2002 FA Vase Final. Ian managed Whitley Bay on two occasions. 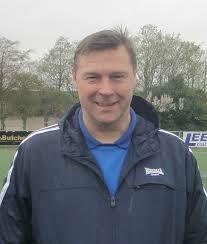 He managed the Club from 2004 to 2014 and during this 10-year spell Whitley Bay won the Northern League title, the Northumberland Senior Cup (twice) and the FA Vase three years in a row at Wembley Stadium. Ian said today “I am delighted to accept the offer of appointment as team manager of this great Club and I can’t wait to start work building a squad for next season. As a manager I like my team to be entertaining but competitive ensuring every opposing Club never has an easy game”. Ian will be joined at the Club by former Bishop player Brian Rowe. Welcome to Former Shots player , been along time Ian but look forward seeing you . Up The Shots !! !